I can’t wait to tell you about my experience with Bumble Bee SuperFresh® Salmon with Garlicky Black Pepper & Extra Virgin Olive Oil, it helped and inspired me to make a quick and delicious meal in under 20 minutes. 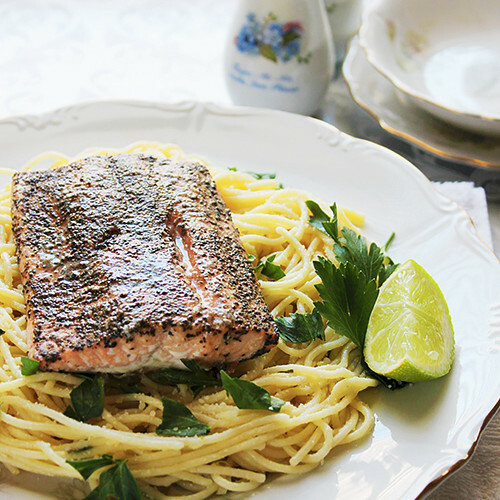 I made Baked Salmon with Spaghetti Al Limone! 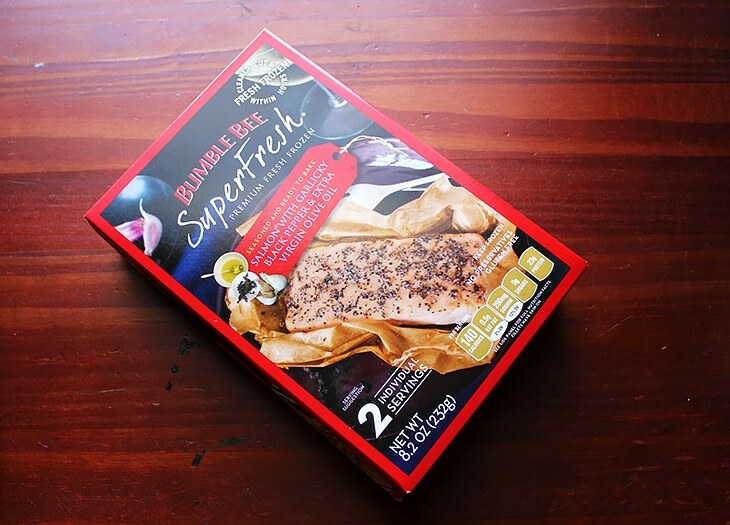 I was excited to receive my package of Bumble Bee SuperFresh® Salmon with Garlicky Black Pepper & Extra Virgin Olive Oil. I was curious to taste it and compare it to the fresh salmon I usually buy from the store. I picked the package, read the instructions, and being the foodie who cooks everything from scratch, I was actually happy to know that baking the salmon is going to be mess and fuss free! I liked that part but was still not sure about the taste. I opened the package and smelled the salmon, no fishy smell at all. In fact, the salmon smelled so good even before baking and it was perfectly seasoned. 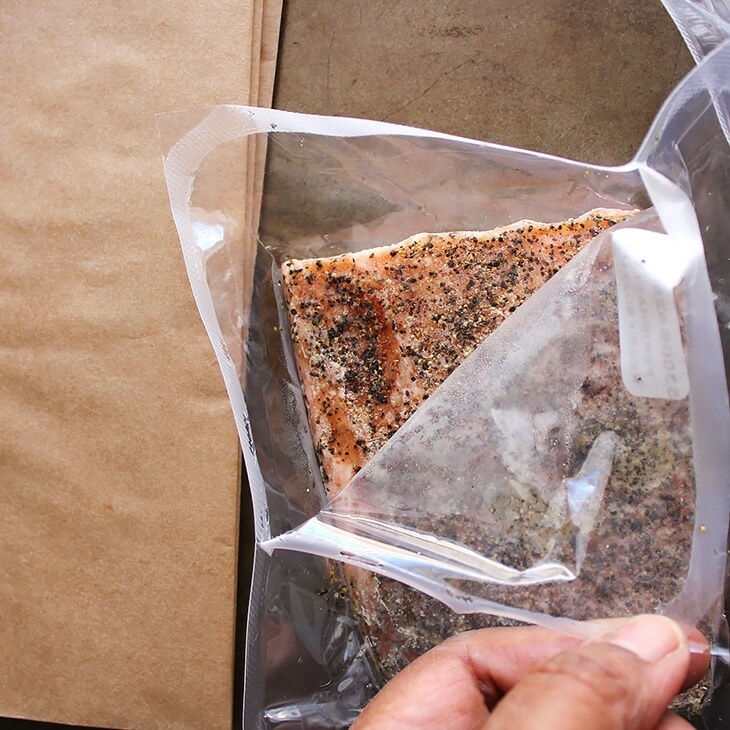 The parchment paper-baking pouch was in the package, the salmon went from freezer to table in under 25 minutes. 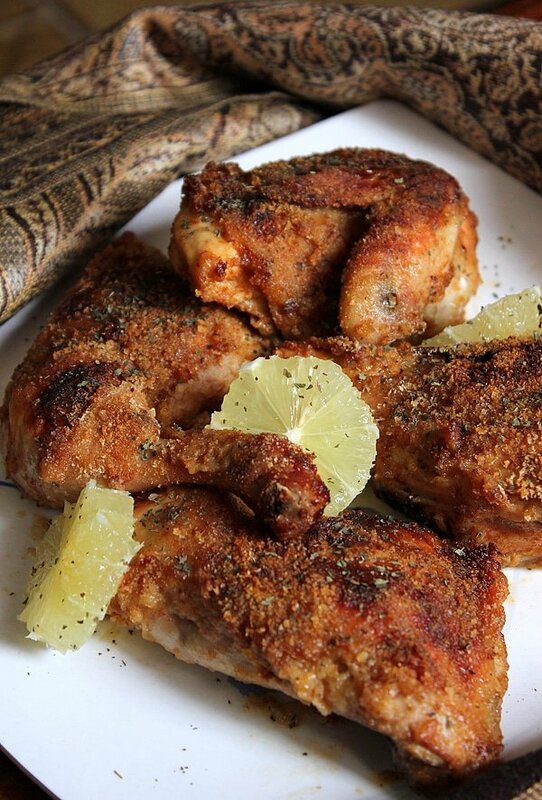 High in protein, richly seasoned with pure and simple ingredients! 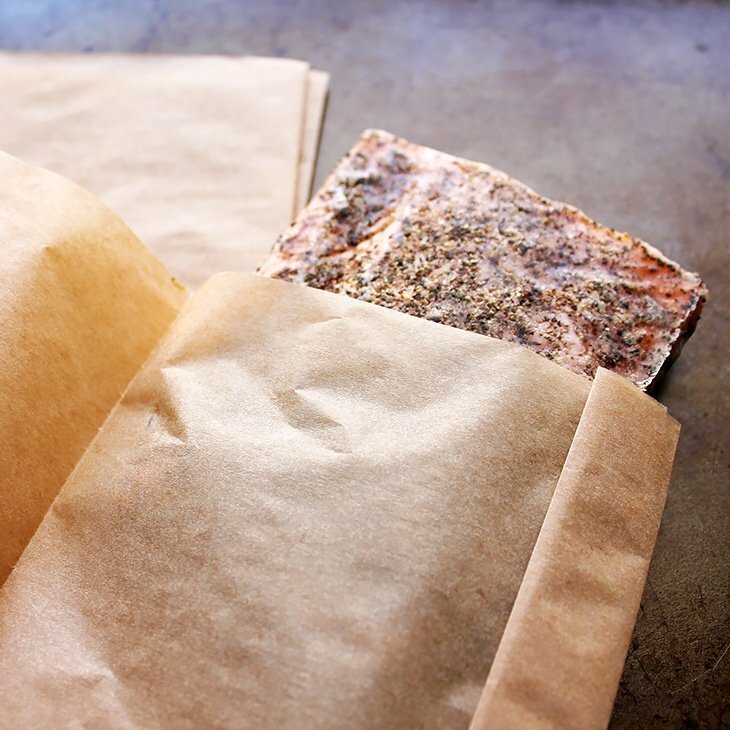 Let me tell you that the parchment paper allowed enough heat to cook the salmon yet left enough moisture in the salmon, which made it so tender. 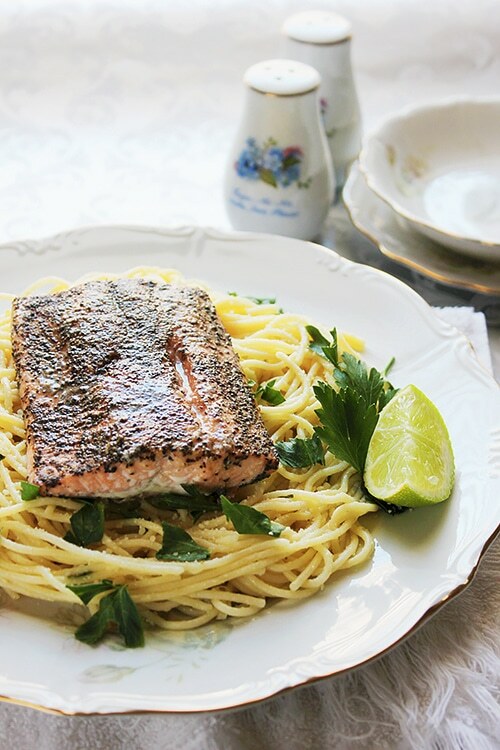 Using Bumble Bee SuperFresh® Salmon with Garlicky Black Pepper & Extra Virgin Olive Oil, made me realize how much time and effort I can save, and at the same time serve my family a high quality dinner. Slip the Bumble Bee SuperFresh® Salmon with Garlicky Black Pepper & Extra Virgin Olive Oil into its own parchment (included) and let your oven do the rest. The salmon came out tender, juicy, there was no need to add any seasoning to it. No fishy smell after baking, it tasted just like a fresh Salmon. 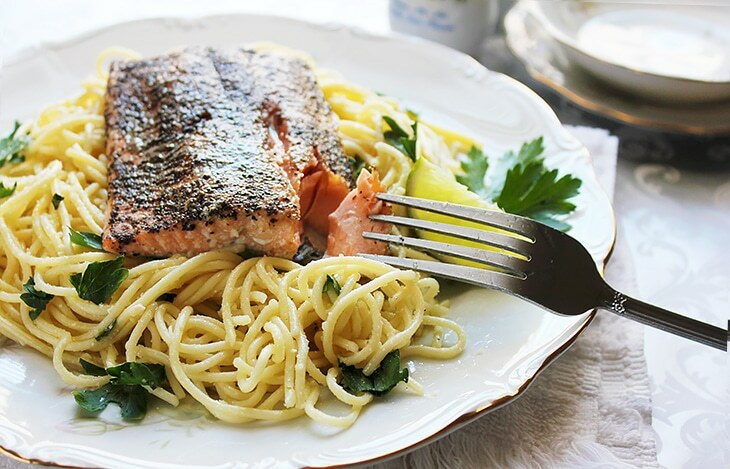 I paired Bumble Bee SuperFresh® Salmon with Garlicky Black Pepper & Extra Virgin Olive Oil with Spaghetti Al Limone. It is a perfect match. 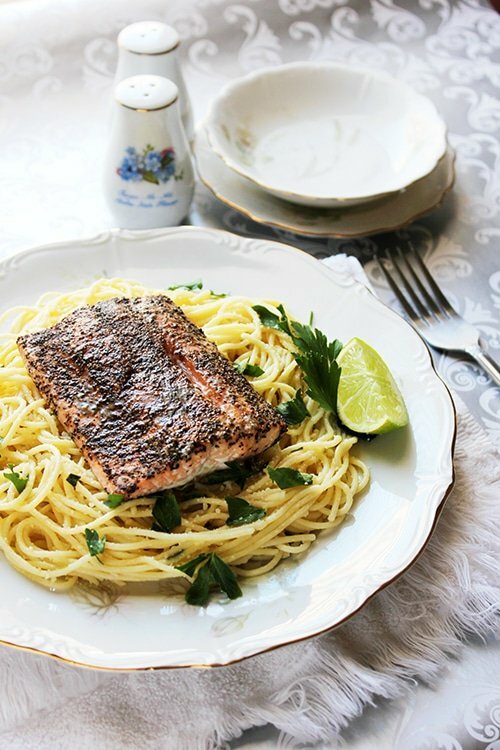 Did I mention that the Spaghetti Al Limone takes 15 minutes to be prepared, so while your salmon is baking you can prepare spaghetti Al Limone. I highly recommend Bumble Bee SuperFresh® Salmon with Garlicky Black Pepper & Extra Virgin Olive Oil. There are other varieties of Bumble Bee SuperFresh®. Check out the store locator to find Bumble Bee SuperFresh® products near you. You can find Bumble Bee SuperFresh® in the frozen seafood section, typically near the seafood counter, at your local grocery store. Bumble Bee SuperFresh® is a complete line of naturally-seasoned, restaurant quality, “fish-forward” prepared seafood solutions for the home. It raises the bar for what seafood lovers can expect from frozen food! 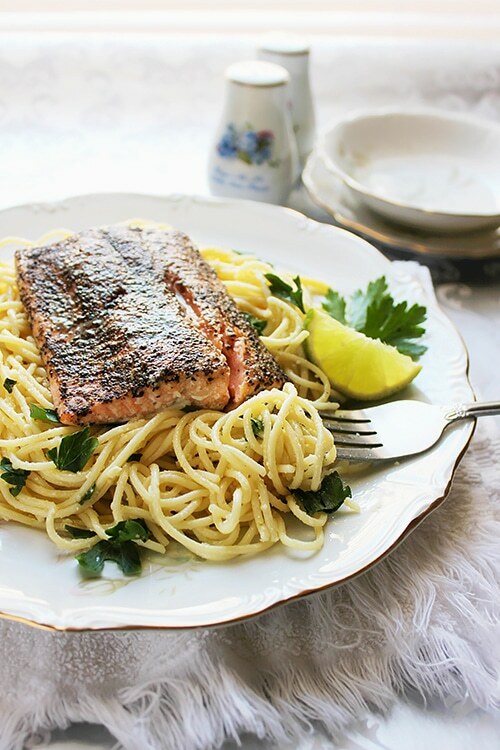 Baked Salmon with Spaghetti Al Limone is prepared in under 25 minutes and is healthy and delicious. The salmon is so tender and juicy you will just love it. In a bowl, add all the ingredients except the olive oil and the cooked spaghetti. Mix well. Slowly pour olive oil to previous mixture while whisking using a small whisk or a fork. In a hot saucepan add the mixture and immediately add the spaghetti. Mix well for 30 seconds then turn of the heat. 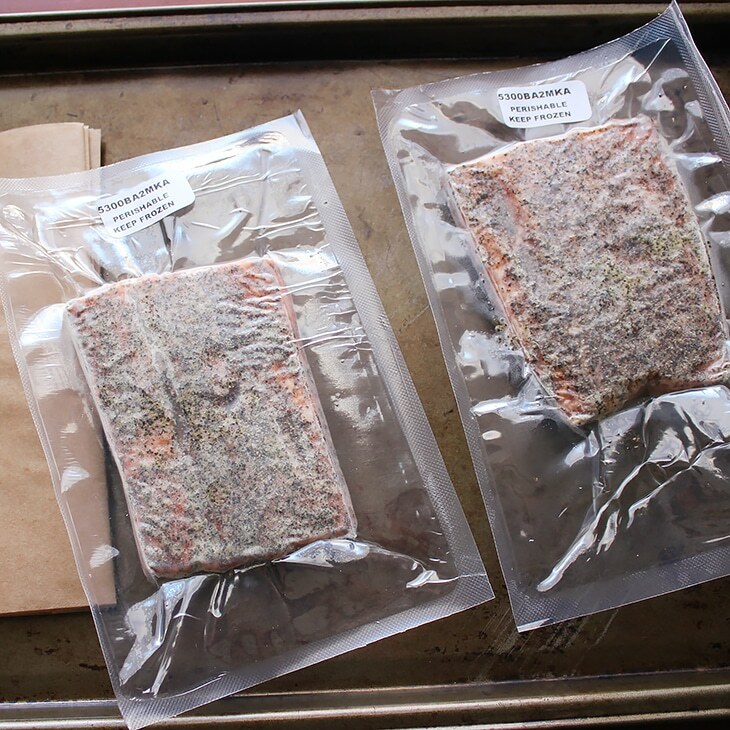 Place the salmon in the parchment paper-baking pouch included in the package. That looks so good! I’m going food shopping this weekend and will keep my eye out for it! 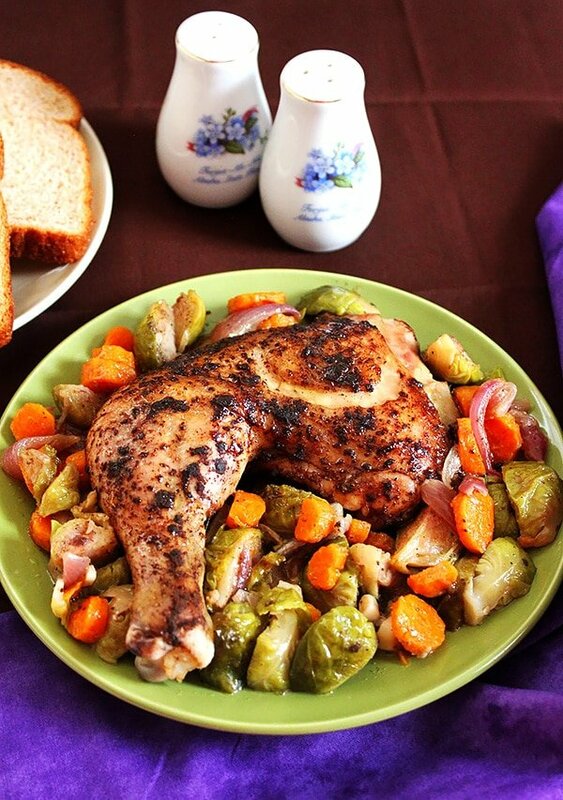 It looks fantastic Muna, and I love how quickly you can have a wonderful meal on the table! So delicious! Salmon, oh salmon…can’t get enough of it! True, there is something about this fish that can’t be found in many other type of fish. YUM! This looks really tasty. What a good-looking salmon! Very delish! I love everything about this dish! 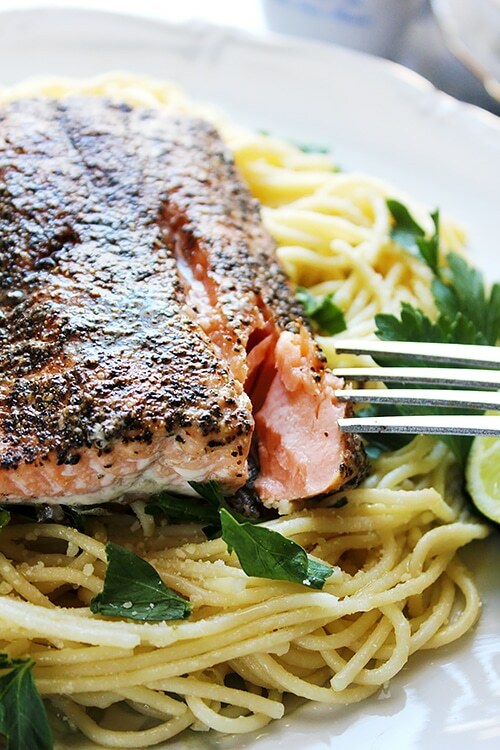 That spicy salmon and that fresh lemon pasta pair so well together! Great idea and beautiful photos!